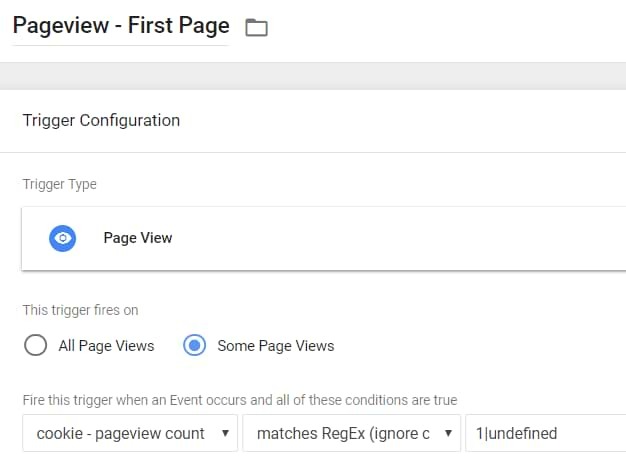 Recently, I’ve received a question from one of my readers asking how can he fire a tag only on the first page view. What’s a use case for that? Situations may vary but that reader mentioned firing tags of ad-networks for the purpose of remarketing or running time-sensitive campaigns. For example, he wants to show ads of a different remarketing campaign when 7 days pass after the first page view (or the first event). However, he’s not sure how to track that first event. I’m not sure what kind of ad-network is that reader using, however, the case is understandable and it is not that hard to achieve, after all. First of all, what are cookies? Simply put, cookies are small pieces of information that websites store on your computer. Cookies only contain bits of text, not anything else. The text can be a user ID, session ID, or any other text. If a website stored a cookie on your browser with some ID and, after a while, you returned, that cookie helps the website to identify that you are the same visitor. Cookies can also store some less personal information, e.g. the number of pages viewed with that particular browser. And that’s exactly what we’ll do here today. 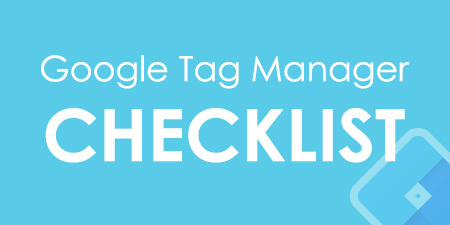 In one of my previous guides, I’ve explained how you can set, edit, and delete cookies with Google Tag Manager. If you haven’t yet, go definitely check it out. So if there’s something you’ll find confusing in today’s blog post, go and read the aforementioned cookie guide. P.S. 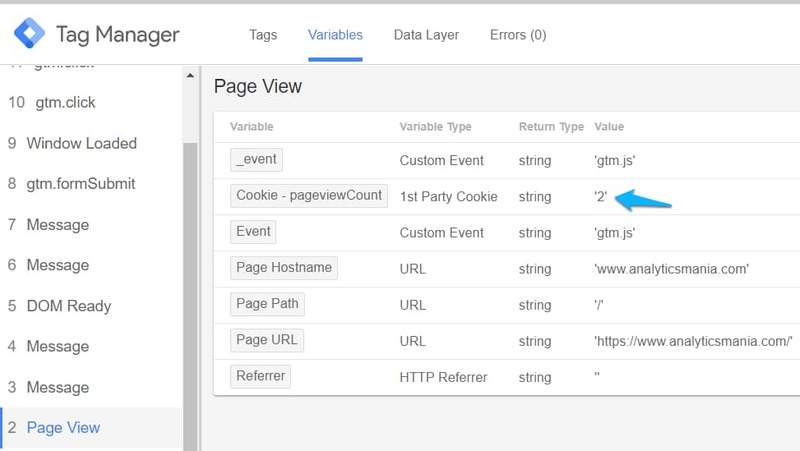 It’s also worth mentioning that in addition to cookies, you can also use Web Storage API in GTM. 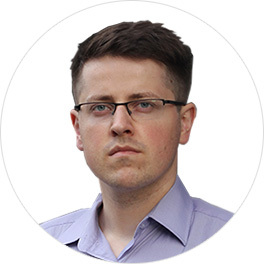 Simo Ahava has posted a guide about it. That code sets the cookie containing the number of how many page views has the visitor done (in general). That number is not limited to a single session. If a visitor on the 1st day makes 5 page views and returns after a month, the number of page views (in that cookie) will change to 6 (if, of course, that cookie is still present in a browser). 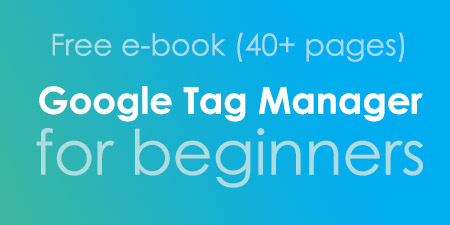 With Google Tag Manager, we’ll read the value of the cookie and use it in triggers. Here’s the code that will increment the number of page views (stored in a cookie) every time a page is loaded (doesn’t matter whether the pages are different or whether a visitor is just hitting Refresh on the same page. By default, this cookie is valid for 30 days. If you want to modify this setting, edit the number in the 37th line of the code. The name of the cookie will be pageviewCount. 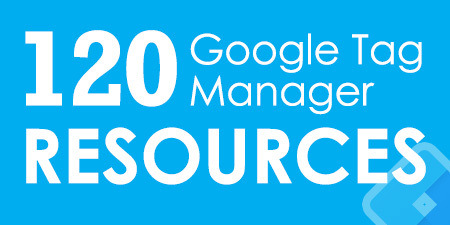 It will return the number of page views that is stored in that cookie. 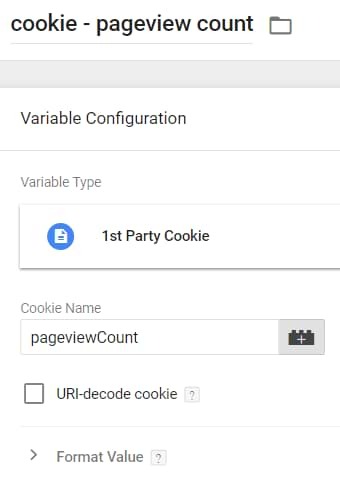 If the value of the 1st Party Cookie Variable is undefined, please check whether your Custom HTML tag has fired properly and whether you entered the correct cookie name in variable’s settings (it is case-sensitive. Only pageviewCount with the uppercase C will work). While testing, you can delete that cookie (thus start the counter from 0) by going to your browser’s cookie list and deleting it. 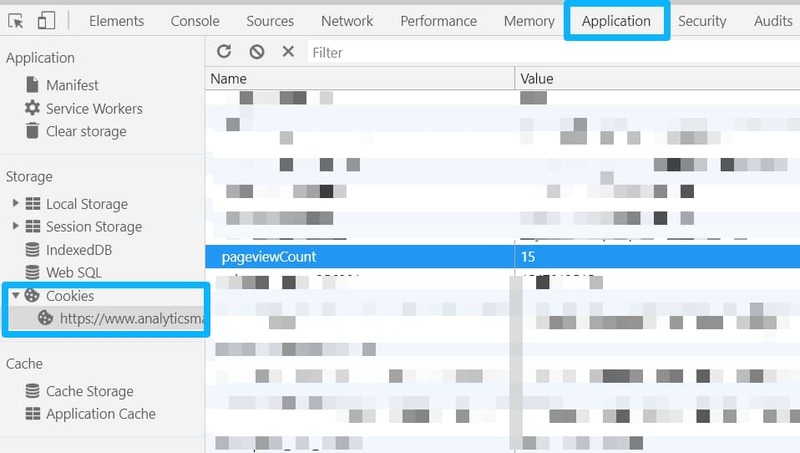 I’m using Chrome so I can do that by going to Menu (Three dots) > More Tools > Developer Tools > Application > Cookies and find the pageviewCount cookie. Click it and hit the DELETE button on your keyboard. 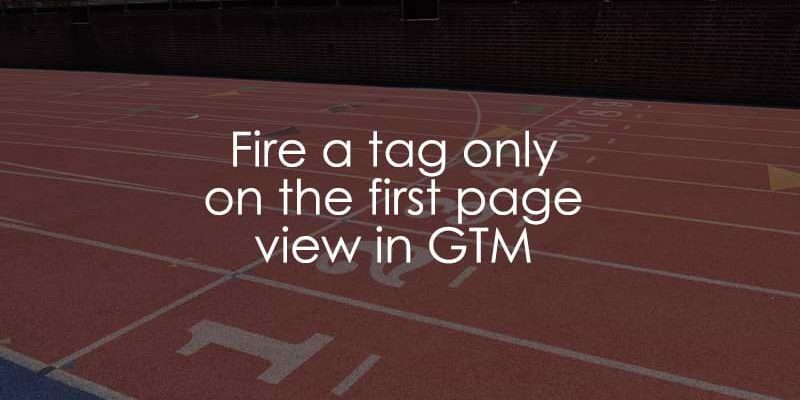 This means that if a cookie contains “1” (meaning that’s the first page view) or if the cookie was not created yet (due to race conditions), that trigger will activate (of course, other trigger conditions must also be met). Honestly, I chose the pageviewCounter solution here because I wanted to show you what other stuff you can do with cookies. Store the visitor’s consent data to be tracked, etc. Have more questions? Feel free to contact me via social channels or just post a question below. Nice work! Many thanks for sharing! Sorry, I don't work with mobile apps thus I cannot give you a tip/solution.